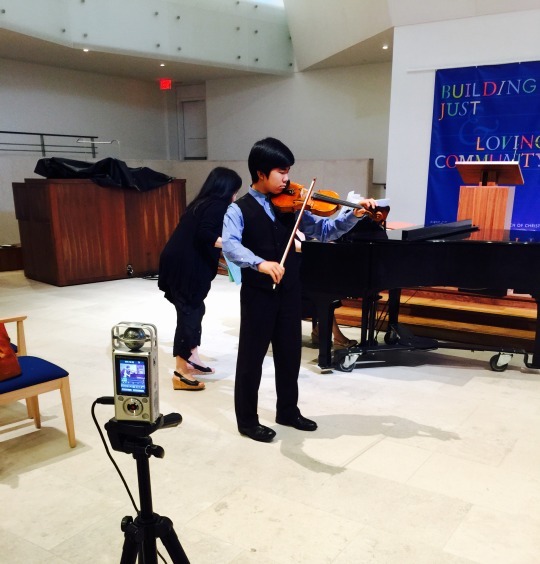 I am writing this blog to describe my current feelings about recording high-level violin with young people. Most of the kids I am recording currently in the studio are age 10-15 and the majority of them are in the 12,13 middle school age range. Recording can be tricky physically and psychologically even for adults but with kids, there are a different set of challenges. It can also be highly exhilarating and the results can be used to celebrate a child’s violin journey or even place in a major competition resulting in performance opportunities. This past year or so I am noticing that after we record, there is a staggering amount of progress we see, almost like we have created a “pressure cooker” environment in the recording sessions. The kids learn how to focus deeper and longer. They start to see the importance of the first minute of a performance and the finality of the last minute. With the stakes higher and a time limit in a recording space, we tend to be pickier and push a little harder in practice and in lessons. Each child is different in how they respond to this added pressure but they all learn from it. It is such a different energy in recording than there is in practice, lessons, or rehearsals. They are being asked to give an inspired performance over and over again. It is like as if whatever muscle needs to be flexed to deliver a captivating performance is having to flex over and over again on command and what results is a sort of reflex memory built to get the body to deliver. To get the full value out of recording, we try and reduce the stressors. The stressors generally are time, money, and energy. So this year we will record tracks in different sessions to reserve energy and money and consider pooling money together for equipment. We have some parents willing to take a course in learning to use equipment in recording. We offer snacks and breaks. We are fortunate to be able to at least partially barter with a church that has brilliant acoustics. The kids will be preparing their literature together and will have a break room to visit and give each other words of encouragement. After each performance the kids have a number of tracks to choose from. I instruct them to do the major portion of eliminating on their own. I will then reduce it down to the final track. They develop criteria for judging the tracks. In doing so, they put themselves in the position of a judge giving them a valuable new perspective. Perhaps most importantly, they are met with videos of themselves playing. They can see the straightness of their bow, their posture, the position of their wrist, etc. They don’t see from this perspective enough in the course of regular lessons. Frequently with the more virtuosic literature, the amount of technique is so distracting that in the moment they don’t perceive unwanted accents, missed dynamics, or a broken phrase. But viewing their takes, they catch this easily and are even fascinated by it, leading us to instant progress. More than not, there is an epiphany and in the very next recording session, there is a breakthrough. Now that our students have witnessed the spurt of progress that appears after recording sessions take place, I believe they look forward to the process knowing they will be met with this reward to carry them into the next level of playing. As they get used to recording, I know we are guiding them through an important analytical process that will contribute to their artistic growth and potentially result in opportunities and recognition for them. July 9, 2015 at 10:17 PM · Very interesting to read!